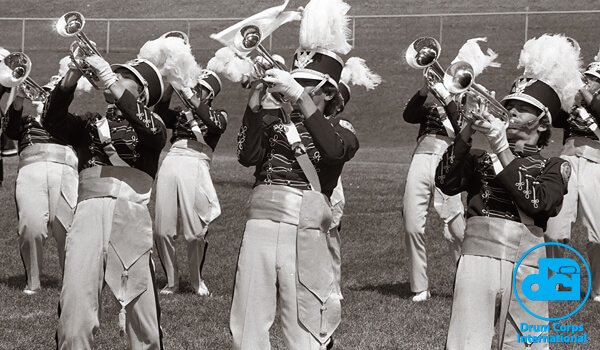 The 1981 Drum Corps International season was the first of two years that the DCI World Championships went to Canada, with the Prelims hosted at McGill University's Molson Stadium and the Finals at Montreal's cavernous Olympic Stadium. Not making the trip to Canada was the PBS television crew that had started taping the Finals for broadcast in 1975, due to complications arising from logistics needed to do a live broadcast in a foreign country. Though these issues were resolved for DCI's return trip to Montreal in 1982, consequently, the 1981 DCI Championship videos were filmed at the DCI Midwest event in Whitewater, Wis. In Montreal, Blue Devils came within three tenths of a point of tying Santa Clara Vanguard, despite finishing 9th in percussion. Vanguard remains the only corps to ever win the World Championship after not being among the top-six corps the year before. 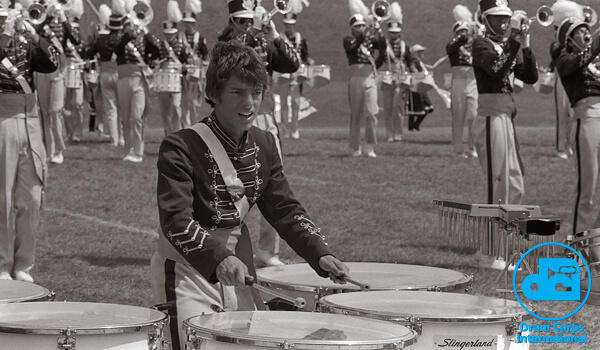 The corps won the title with "Young Person's Guide to the Orchestra," a piece they also played in 1973 and 1974. Garfield Cadets took 6th place in Whitewater, but slipped to 7th in Montreal. In many ways, the 1981 repertoire would represent the end of a typical traditional repertoire for the corps, being all over the stylistic map. The show opened with two movements from Johnny Richards' "Adventures in Time," distilled from the eight-movement work, subtitled, "Concerto for Orchestra," written for Stan Kenton's Mellophonium Orchestra and recorded in 1962. The album explored many different and unusual time signatures well before bandleaders like Don Ellis would take that concept several steps further. Kenton featured a four-man mellophonium section, playing instruments created by C.G. Conn, Ltd. that were unlike French Horns or mellophones of the day. The first movement from the "Concerto for Orchestra" was kicked off in high gear with the driving "Commencement," followed by the slightly more mellow "3x3x2x2x2=72," with the original brazen mellophonium trills intact. The percussion feature "Egyptian Danza" was off the first track from Al Di Meola's "Casino" album of 1978. Di Meola is best known as a Latin jazz-fusion guitarist who kicked off his career playing with Chick Corea. He has won Guitar Player Magazine's Best Jazz Guitarist reader poll four times. The concert production of "Fire Dance," from Woody Herman's "Road Father" album of 1978, was co-written by Eastman School of Music buddies Jeffrey Tyzek and Allen Vizzutti. The album was recorded direct-to-disc without the use of overdubs or multitrack recording, requiring a performing organization to be perfect. Tyzek enjoyed lengthy collaborations with Chuck Mangione and Doc Severinsen and is highly regarded as a pop orchestra conductor. Vizzutti, in addition to his prolific career as a solo trumpet performer, has also performed on more than 150 motion picture soundtracks. Bobby Sherwood wrote "The Elks' Parade" and recorded it with his jazz orchestra in 1942. It became one of the icons of the dance/swing era. One of the soprano bugle soloists featured in the piece was Al Chez, longtime trumpet player on the "Late Show with David Letterman" until 2012, now with Al Chez & the Brothers of Funk Big Band, an ensemble he formed in 2008. The closer of "Pieces of Dreams" is from Michel Legrand's 1969 album, "After the Rain," with lyrics by Alan and Marilyn Bergman. Legrand wrote more than 200 film and television scores and produced more than 100 albums. Check out this video clip of the piece sung by Johnny Mathis on "The Tonight Show With Johnny Carson." Carson later referred to this performance as the greatest ever presented on his show. The 1981 season was a moment of great transition for the Cadets. Prior to 1981, the corps' highest DCI World Championship placement was 10th. In 1982, the Cadets bounced to 3rd place, and just two years after its 1981 season, the corps won its first DCI World Championship title. For this week only, you can save on the Legacy Collection DVD that contains this complete Garfield Cadets performance. Discount DVD offer ends Monday, Dec. 9 at 8:30 a.m. ET.